Geckos employ dry adhesion, using a combination of microscopic hairs on their toe pads, as well as other aspects of internal anatomy, to climb vertical walls and run across ceilings, a skill that has long fascinated scientists. In particular, it's a mystery how some species as much as 100 times heavier than others can use adhesion so effectively. Geckos range in body size from about 2 grams to over 250 grams, a difference in scale greater than 100-fold. It had been assumed that larger toe pads account for the ability of larger geckos to climb as well as smaller ones. But now a team of biologists and polymer scientists at the University of Massachusetts Amherst show that increasing the surface area of gecko toe pads alone cannot explain this. Instead, in a series of animal and synthetic experiments, they suggest that the bodies of geckos act much like a spring, and that as geckos become larger, they also become stiffer, thus enabling them to climb as well as small geckos. Reporting in the current issue of PLOS ONE, functional morphologist Duncan J. Irschick, polymer scientist Alfred J. Crosby and colleagues show that geckos have a spring-like mechanism in their bodies to enhance adhesion as they become larger. In 2012, four of the authors invented the flexible adhesive Geckskin. It mimics a gecko's ability to strongly yet easily attach and detach their feet to walk on walls and ceilings. The lead author of the current work, doctoral student Casey A. Gilman, measured the ability of five gecko species varying in weight from about 0.7 to 3.5 ounces (2 to 100 grams) to adhere to glass on a force-extension instrument that measured geckos' clinging force. She also measured changes in the stiffness of gecko anatomy. 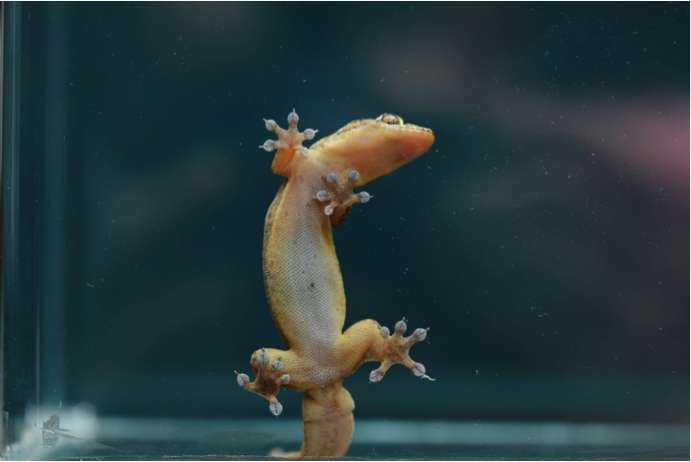 Further, the polymer scientists in the group created synthetic three-toed gecko feet from fabrics and soft elastomers to model adhesive performance. Gilman and colleagues found that as gecko body size increased, their complete adhesive system, that is, the tendons, skin, connective tissue and setae, became stiffer, resulting in the larger animals' legs and feet being far stiffer than in smaller geckos. The increased stiffness plays an important role in enabling larger geckos to produce sufficient adhesive forces to climb, the authors say. By incorporating both the area of the gecko toe pad and stiffness in their model, the biologists found it was possible to explain 92 percent of the variation in adhesive ability among a variety of gecko species. "As predicted," the researchers note, "the gecko adhesive system becomes less compliant (stiffer) as geckos become larger." The team's materials scientists constructed a model gecko system using a synthetic adhesive pad and tendon, or mechanical spring, and ran experiments to simulate the dynamic motion of climbing. These experiments with synthetic gecko feet showed the same pattern, confirming results observed in live geckos. Crosby says, "These findings not only help us to understand the natural world around us, but they also provide the physical ingredients for engineers to build new, better adhesives." Irschick says the increased stiffness enhances adhesion because it enables the surfaces forces at the surface, produced by van der Waals bonds, to be stored and distributed efficiently. "Our analysis shows that simple mechanical changes in geckos explains a large portion of the adhesive ability of geckos."